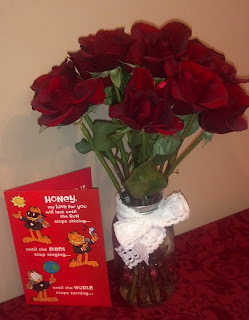 Something Pop did when our daughters were young was buying each of them a Valentines Day card...that blessed me and them. He did it on his own and I remember being surprised and so pleased when he did it. He continued to do it until our daughters grew up and had their boyfriend/fiance'/husband as their #1 Valentine. It still blesses me when I think about it. Of course Pop and I love to get our grandkids a Valentine of sorts and this year, I thought long and hard about what to get. As I thought about how we feel about our grandchildren, I thought about how they make our hearts soar...that's it!! Kites for Valentines Day!! I delivered them to the Superheroes and the cowboys yesterday and they seemed really tickled with them. (The Unconventionals will get their soon.) They don't understand yet how they make Pop and I feel so the sentiment goes right past them; but their mommies and daddies get it. I hope that when they fly the kites, they will have tons of fun whether they fly them at home or they bring them to the expanse of the farm to set sail...and I hope their parents will be blessed by the sentiment expressed by this year's Valentine gift and the love it represents...it's funny, isn't it, how physical things can make and trigger memories? 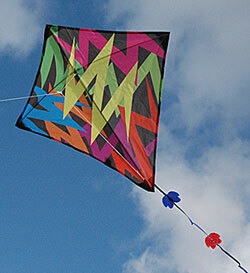 Kites are special to me because when I was small, my Dad took the time to build kites with me and my siblings. So now I will look at kites fondly from memories as a child and as a grandparent. Good stuff. Now, Bitty Princess is too small to fly kites so I found something else to express how Pop and I feel about her...spoons! That's right...she is so precious that she has Pop and I "eating out of her hand" so to speak...and for a period of time, her sweet little hands will be instrumental in her nourishment. But there will come a time when she needs to be spoon-fed and then learn how to use spoons. 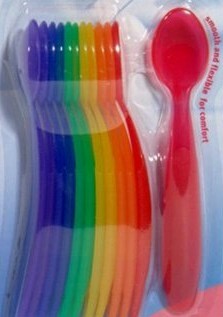 So Bitty Princess gets spoons for Valentines Day this year. I hope that when her daddy and mommy use these to feed her, they will think of how much we love their Bitty Princess...and them. I am thankful that God is LOVE and that we can share it so freely because of His great love for us. Happy Valentines Day to our readers!! We have one adopted grandchild. A grandson. Q is an incredible addition to our growing family. He is adorable, fun, happy, and just makes us smile...and laugh. We cannot imagine life without him. His adoption by Farm Chick at Heart and EJ has given us much insight into how God feels about us (His adopted kids). Our lives are richer now than we could have ever imagined. Before his adoption, I didn't know how I would feel about him. I was a little nervous that I wouldn't be as attached to him as to our biological grandchildren. When he came home, all my fears melted into a puddle of quickly evaporating nothingness. Pop and I were smitten from the beginning with a precious baby boy given to us by God. What a blessing! When Farm Chick and EJ received a call on Christmas Eve 2011, we were so excited at the prospect of another adopted grandson! There were some reservations with the little fellow's mother that they shared with us...things that made us think she might not follow through with her resolve to place him for adoption. We loved him anyway and anticipated his arrival. Farm Chick and EJ met Baby C's birth mother and loved on her as God called them to do. As with each of our grandchildren, Pop went on a bear hunt to find the perfect "Pop Bear" for Baby C. He and I looked at about six bears that were all the "same", but anyone who truly looks at teddy bears knows that they each have different faces regardless of the fact that they are all cut and sewn from a single pattern. We studied each face and chose just the right one...then we waited. Farm Chick and EJ got another call...Baby C would be remaining with his birth mom. We felt like God had somehow prepared us ahead of time. In spite of loving him and anticipating his arrival, there was always prayer that God would do what He deemed best and those prayers were answered when the call came. There was sadness, but there was peace. There was joy knowing that Baby C's mother loves and wants to do the hard work of parenting him. I was okay with that...then I caught a glimpse of Baby C's pop bear sitting on my loveseat and fell apart. I grieved for him, knowing that he would not be a part of our family. The grief I felt caught me off guard...it was similar to the grief I have felt when our daughters have miscarried early in several of their pregnancies. It was like a wave that toppled me over for a brief period of time. I cried...then I found my feet once again on solid ground. I find solace in knowing that God's plan is infinitely better than any plan I can conjure up. I knew that Farm Chick was putting together a box of things to be mailed to Baby C's mother so I asked if she would include Baby C's pop bear with a letter from me. I thank God for what He is doing in the lives of His beloved children...including me. 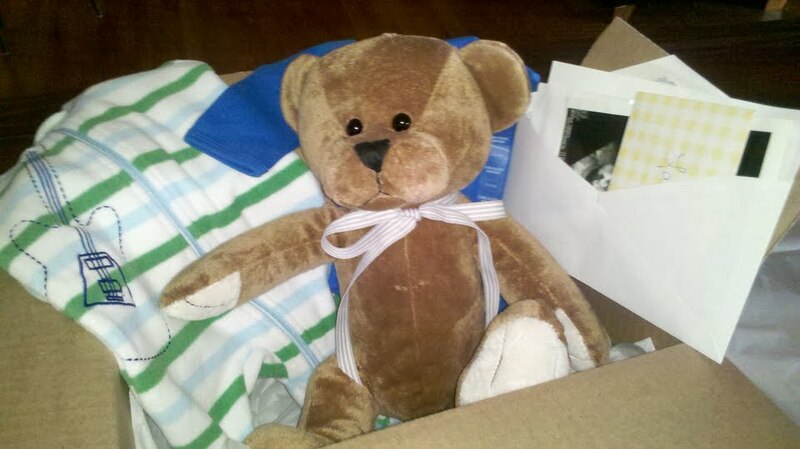 I will always remember Baby C and will think of him on his birthday each year. I pray that God will provide for him and his mommy richly and that He will rain down blessings on them. For those who are led by the Spirit of God are the children of God. The Spirit you received does not make you slaves, so that you live in fear again; rather, the Spirit you received brought about your adoption to sonship. And by him we cry, "Abba, Father." The Spirit himself testifies with our spirit that we are God's children. Pop and I decided on some resilient vinyl plank flooring for all but the bedrooms in our farmhouse. 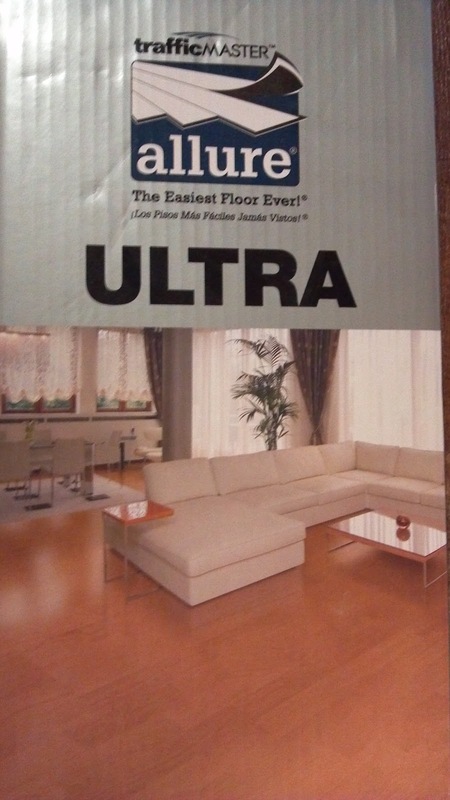 My sister and her hubby were working on a kitchen/dining room/living room renovation and she introduced us to this product (Allure Ultra). It looks great in their space so I started researching and found that there just isn't anything else on the market quite like it...it is waterproof, requires no underlayment, doesn't have any adhesive...and as they say it is "The Easiest Floor Ever!" 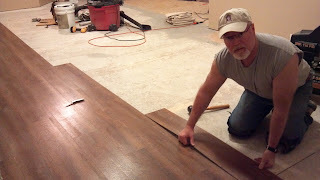 Pop did his usual research and preparation before we began laying the flooring. 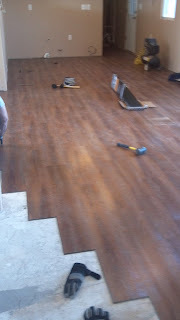 He fixed and leveled the sub floor, then figured out the best place to begin laying "The Easiest Floor Ever!". all your cuts are perfect. So...having said that, we are very happy with the results. I think it will be easy to care for and will stand up to the amount of traffic we will have on it (11 grandkids and counting). It has a lifetime warranty for residential installation so we figure we won't ever have to replace it. We joked with the boys that someday they will probably be tearing out the very floor they were helping to install because Pop and I plan on still having it in place when we go live with Jesus! 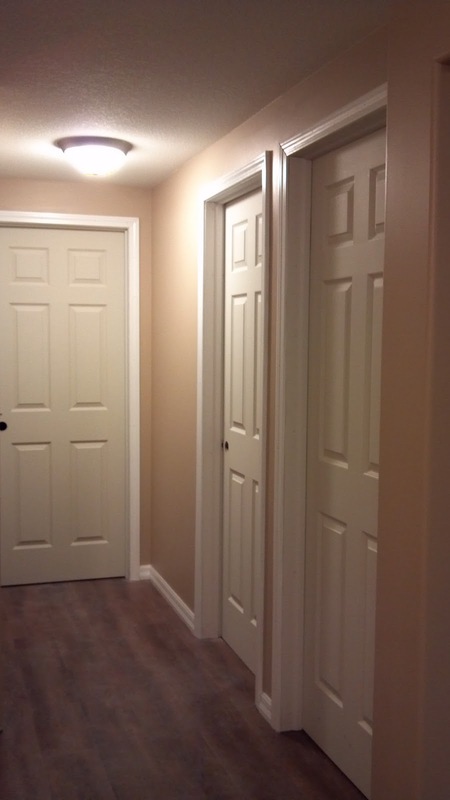 We are working on the doors and trim now and have scheduled the carpet layers for the bedrooms. Pop and I even went ahead and purchased a KING size bed for our new room!! Stay tuned for future updates! We're getting there!